Not Verified | The temperature in the airport is so cold. We asked staff to give a blanket but they don’t have any. We have to spent here all night waiting, and it’s super cold here. Not Verified | Arriving from Bahrain and as usual bus from plane to terminal. This time at transit security there was a very pleasent security guy who was courteous and polite! So nice when you get someone who is well mannered. A tip if you want to find a clean toilet as I discovered is near to gates 58-61 there are two lots of toilets down stairs that are clean and only used when gates are in use. Try to go here while a gate is reasonably empty and you will have a good clean toilet experience. Even better than an overcrowded business lounge. Trouble free transit this time around even though it’s very crowded at night time..WiFi was pretty good reliable connection away from the main central area where duty free shops are. Not Verified | Arriving from Melbourne a major city we were once again herded to the outer reaches of this airport where we had to use buses. As we were on an Etihad flight normally the bus driver drops you at T3 but for some reason this driver decided we’d be dropped off at T1! This meant a long walk to get to T3 & there were a few older folk who I know had connecting flights out of T3 so they’d have to endure a long walk. Not what you need first thing early morning arrival after 14hrs on a flight. The plus was that transiting was quick through security so quickly through here. On departure for flight to Bahrain the boarding process was totally chaotic, only 1 ground staff & 2 lines of passengers & here there was no such thing as business class or priority boarding it was a free for all, dreadful and totally disorganized, buses once again out to the nether regions of the airport to the plane. 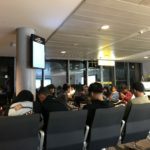 The Airport early morning is a lot less crowded than night time thankfully so you could get to use a toilet which are relatively clean because at night time they are filthy so obviously cleaned only in the morning. It’s still an airport that you are really glad to leave behind though. "just too many people in such a small area"
✅ Trip Verified | Once again you are shuttled from the plane by bus to the drop off transfer arrival point where you weave a myriad of roads which are very busy. Transit at this old airport is always a nightmare but I must have got lucky as the security check wasn’t too crowded, but you still had to run the gauntlet of security staff who really don’t want to be there doing their jobs with many busy with the smart phones as is the case these days. Toilets are still dreadful and should be avoided, there’s just too many people in such a small area and you are always glad when you board you flight and even that is disorganized. "an old and chaotic airport"
✅ Trip Verified | Avoid at all costs. Abu Dhabi airpoirt is both an old and chaotic airport. Quite simply an unpleasant place to be. 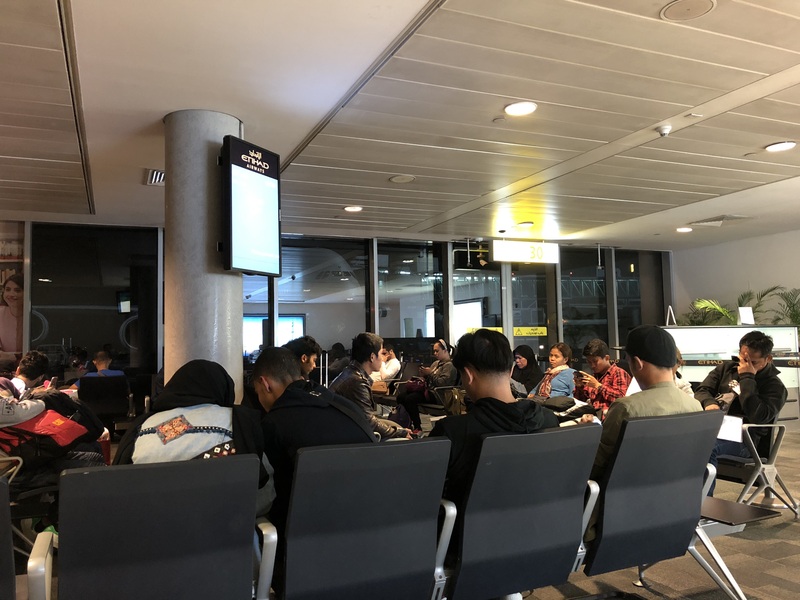 It is very hard to navigate around, and involves long walks between the gates you need to walk to for your connecting flights. Furthermore it is overcrowded, hot and chaotic. Transitting in Abu Dhabi is a very stressful experience. More often than not, your plane will not even stop at a gate. Instead you have to disembark on the runway and take an airport bus to the gate. The customs and security personnel are rude and unfriendly. The lounges are miles away from the gates. There is very basic facilities if you are travelling in economy. ✅ Trip Verified | Expensive. Seriously. The prices are hiked to such an exorbitant amount, it’s really not worth purchasing anything here. Design of the airport is flawed. They should expand for space. It’s crammed with so many things that it makes the airport look smaller than it already is - staff is rude. A norm with UAE, generally. "air-con makes it feel like the Arctic"
✅ Trip Verified | Perhaps the most plaintive thing is experiencing an 11-hour layover in this cold airport without bringing any long-sleeve coat. I’m transferring from China, a sub-tropical country, to Oman, a tropical country. How am I supposed to know I should bring my down jacket with me?! And don’t laugh, as I’m not exaggerating for one bit. I saw passengers wearing down jackets, scarves, and layers of pullovers. And how I envy them! I basically wear all my three T-shirts and still freeze to death, thinking I might end up with hyperthermia. Walking in the aisle gives me goose bumps that won’t go away. Yes I know it’s quite scorching here during summer, but do you have to air-con the place to make it feel like the Arctic? ❌ Not Verified | Very poor airport design. Having arrived from Kuala Lumpur en route to London, it took an unbelievavsble 45 minutes from wheels touch down to reaching the transit lounge (due to long taxi time from landing to aircraft parking, then bus ride in the heat to terminal building, then security queue and finally a painfully long walk to the business class terminal). There is only one toilet to be shared across all business class passengers. actually there are two toilet if you include the disabled toilet. Avoid this airport until the new one opens in 2019 I believe. Next time go through Qatar. ❌ Not Verified | As a 22 year old college grad who has spent the past few years living in squalor, my expectations for air travel aren't very high. That being said, I'm pretty disappointed with Abu Dhabi's airport. Before I begin, it's worth noting that I'm writing this in the midst of a 8 hour layover, which probably isn't helping my mood. A few of the other reviews complained about the humidity, which personally I don't have an issue with - the facility is well enough conditioned to avoid heat stroke. To make things simple, I'll list pros and cons from my experience today. Pros: Good wifi. The massage I got was actually pretty decent. Fast queue times (just kidding, I still have a few hours before I find out if that happens for sure). Cons: 45 minute massage cost 105 USD. Very average ramen noodle + beef cost 17 USD. Poor airport design (I've had easier times navigating labyrinths). The tables in the smoking lounge are falling apart. Cigarettes only available by the carton. No alcohol in the daytime (to be fair, this was due to a religious holiday). The employees aren't very helpful, I was looking for the sleeping pods that were advertised on the website, after walking around for 30-40 minutes with several employees pointing me in several different directions, I eventually discovered that the sleeping pods were no longer in the airport. Tips to Abu Dhabi: Give each traveler a map + crayon when they get off their flight. Lower your food prices or hire flame jugglers to entertain me while I eat your sub par noodles. Sell cigarettes by the pack. Bring back the sleeping pods. ✅ Trip Verified | Hot and humid. Overcrowded. Staff have no idea how to deal with travelers. Worst of all, and most troubling, security is incomplete. I witnessed the following: Passengers setting off the metal detector but not being searched. Not passing bags through the x-ray machine. When I tried to raise concerns with the staff I was abruptly told to move on. Indeed I set off the metal detector but no one searched me. How is this level of incompetence allowed by IATA? Will not use this hub again.